The World Number One enjoyed arguably the greatest campaign in the history of The European Tour, capturing four of the most prestigious titles on offer, including two Major Championships, en route to winning his second Race to Dubai crown by a dominant 2,168,410 points from his nearest rival, Henrik Stenson, the 2013 Golfer of the Year. McIlroy also led the way in earnings on the US PGA Tour, becoming the first player to top the money lists on both side of the Atlantic in the same season on two occasions, while he also starred in Europe’s emphatic Ryder Cup victory against the United States at Gleneagles. 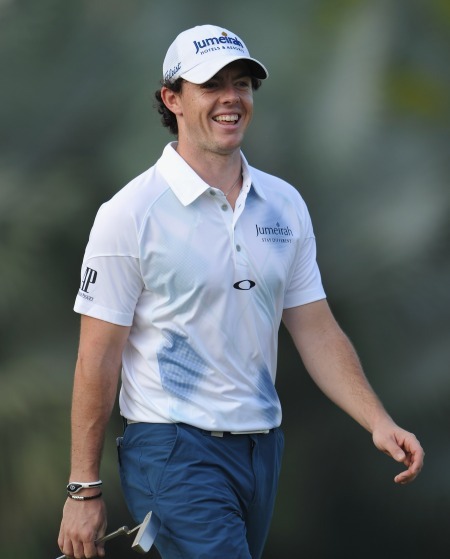 The Northern Irishman’s astonishing year began with a tied second place finish in the Abu Dhabi HSBC Golf Championship. He then recorded his first top ten finish in the Masters Tournament at Augusta National before claiming his first title of the season at The European Tour’s flagship event, the BMW PGA Championship, coming from seven shots back with a final round of 66 at Wentworth Club. But his best was yet to come, as he embarked on a stunning streak in the middle of the summer, lifting his first Claret Jug with victory in The 143rd Open Championship at Royal Liverpool Golf Club, then capturing his maiden World Golf Championship title in the WGC-Bridgestone Invitational at Firestone Country Club, in Ohio. The 25 year old then sealed an historic hat-trick of victories in consecutive appearances by winning the US PGA Championship for a second time in three years at Valhalla Golf Club in Kentucky, becoming the third youngest player after Jack Nicklaus and Tiger Woods to win three of golf’s four Major Championships. A month later he helped Europe to a glorious Ryder Cup victory at Gleneagles, contributing three points including putting the first blue on the board in the Sunday Singles with a stunning 5 and 4 demolition of Rickie Fowler. McIlroy then finished joint second in the Alfred Dunhill Links Championship a week later, before signing off a sensational season by finishing joint runner-up for a third time in 2014 at the DP World Tour Championship, Dubai. 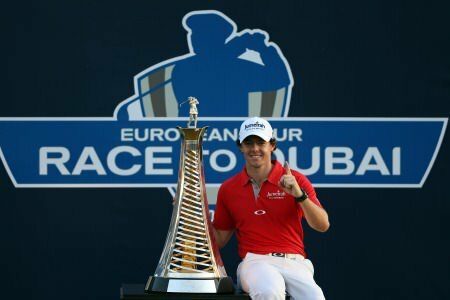 Having been named Golfer of the Month in May, July and August, McIlroy was unanimously voted The 2014 Race to Dubai European Tour Golfer of the Year by a panel comprising members of the Association of Golf Writers and commentators from television and radio, becoming the youngest multiple winner of the coveted award. McIlroy said: “To be named the European Tour’s Golfer of the Year for a second time is a huge honour and one I am extremely proud of. If I had won any one of those four titles it would have been a good year, but to win all four, to win The Race to Dubai, and to be part of another fantastic European victory in The Ryder Cup, means it is a great one. George O’Grady, Chief Executive of The European Tour, said: “The 2014 season will go down as one of the greatest in the European Tour’s history, and it will be defined by Rory McIlroy’s astounding accomplishments on the global stage. “Europe’s performance to retain The Ryder Cup and Martin Kaymer’s dominant victories in the US Open and Players Championship on the US PGA Tour alone would have made it a year to remember for European golf, but Rory’s victories in four of the biggest championships on our International Schedule will ensure the story of this season is retold for many years to come. Quite rightly, therefore, it is Rory who receives our Golfer of the Year Award for 2014. Derek Lawrenson, Chairman of the Association of Golf Writers and Golf Correspondent of The Daily Mail, said: “Having started my writing career chronicling the winning adventures of Seve Ballesteros, Sir Nick Faldo, Sandy Lyle, Ian Woosnam and Bernhard Langer, it seems amazing to consider this year the best of all for European golf. “But given the welter of achievement, who could seriously argue? Three majors have been claimed by Europeans in the same season for the first time since the formation of The European Tour, while The Ryder Cup was won with a supremely confident swagger. “Leading it all were two men. In America, in the space of just over a month, Martin Kaymer won the Players Championship and then the US Open at Pinehurst with arguably the best 72-hole performance of the season. He would have been a most worthy golfer of the year. James Haddock, Golf Reporter for Sky Sports News said: “Rory is deserving of this vote after a year where he struck fear into his opponents and began taking a grasp on golf with a season of emerging dominance. “With an impressive tactical performance at Hoylake and gutsy fight-backs at both Wentworth and Valhalla, Rory proved he is quickly maturing into a golfer who could have a major say in this sport for a very long time to come. When you add to that his play at The Ryder Cup, where he impressed once again, it all amounted to a truly excellent year, one where his game raised up another level. It has set up a tantalising prospect for 2015. The full list of Race to Dubai European Tour Golfer of the Month award winners in the 2014 season was: Spain’s Miguel Ángel Jiménez (December 2013), Scotland’s Stephen Gallacher (January), France’s Victor Dubuission (February), Welshman Jamie Donaldson (March), Frenchman Alexander Levy (April), Northern Ireland’s Rory McIlroy (May, July and August), Germany’s Martin Kaymer (June), Ireland’s Paul McGinley (September), England’s Oliver Wilson (October) and Sweden’s Henrik Stenson (November). Any remote hope the PGA of America might have in seeing Rory McIlroy defend his US PGA title at Whistling Straits faded a little more on Wednesday when the world No 1 informed tournament officials that he will not be defending his World Golf Championships-Bridgestone Invitational title in Akron next week. All smiles. Rory McIlroy is No 1 on both sides of the pond. Picture by Getty ImagesIt’s little wonder the European Tour is looking to revamp its end of season schedule with a play-off series after Rory McIlroy became the youngest European No 1 for 31 years and Ireland’s first since Padraig Harrington in 2006.